The Miracle Mile Residential Association boundaries are generally (although not exactly) encompassed by the Census tracts 216300, 216200. The following community, demographic, housing, tax and HMDA reports have been produced using The Reinvestment Funds Policy Map system. MMRA Community Profile Report (PDF, 90 KB): Information on population, racial composition, age, income and workforce in the MMRA area. MMRA Rental Housing Report (PDF, 74 KB): Rents by bedroom size, income and affordability data for the MMRA area. MMRA Internal Revenue Service Tax Report (PDF, 98 KB): Types of deductions people are making on their income tax return, how many tax filers are making contributions to an IRA, contributing to charities or claiming the EITC within the MMRA area. MMRA Home Mortgage Disclosure Act (HMDA) Report (94 KB): Summary of the number, typical amount, and type of home mortgages originated in the MMRA area. MMRA Home Sale Report (82 KB): Summary of the number of sales, median sale amount, aggregate sale amount, and Loan-to-Value ratio for 2006, 2007 and 2008, and for all quarters of 2007 and 2008, along with housing market trends between 2000 and 2008 for the MMRA area. 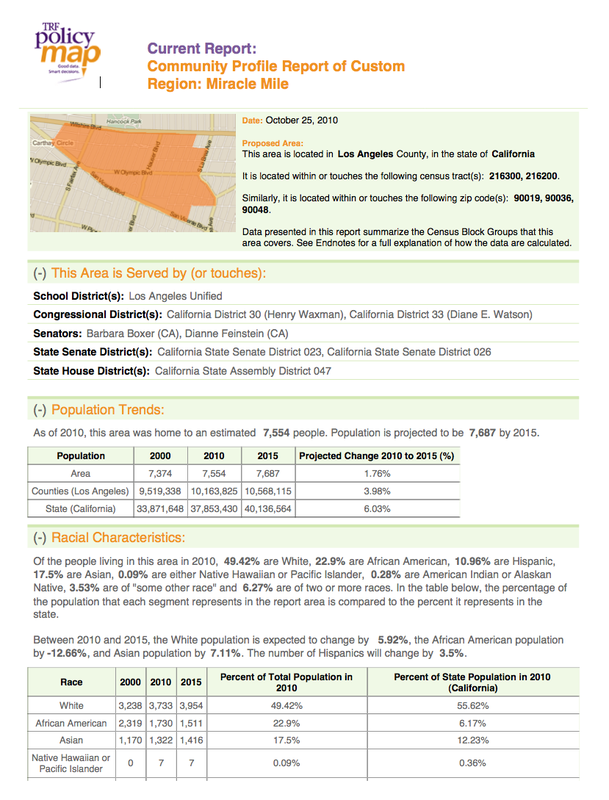 The following demographic, economic and housing reports have been produced using Neighborhood Knowledge California (NKCA). Please note: The reports are based on data from the 2000 Census (SF1 and SF3). Data is aggregated by NKCA from seven Census block groups which generally (but not exactly) match the boudaries of the MMRA. I love the Miracle Mile neighborhood. I’ve lived in Santa Monica for 17 years and my girlfriend lives in Miracle Mile. I had no idea what a great walking town it is until she showed me. Strolling through the La Brea Tar pits and imagining prehistoric creatures strutting down Wilshire Blvd., makes the place that more magical. There’s free jazz, the museum, lots of great food, and just wonderful vibes all around.